German Shepherd Dogs - The German Shepherd Dog or Alsatian, is a breed of dog. German Shepherds are highly intelligent, agile and well-suited to active working environments. They are often deployed in various roles such as police work, guarding, Search and Rescue, Therapy and in the military. They can also be found working as guide dogs for the blind. Despite their suitability for such work, German Shepherds can also make loyal and loving pets inside the home. They enjoy being around people and other animals. German Shepherds are well-suited to obedience, with advanced & prestigious titles available to test both the handler and dog in various schutzhund trials. This information is licensed under the GNU Free Documentation License. It uses material from the German Shepherd Dog article on Wikipedia.org. 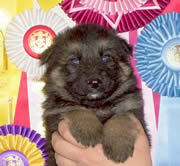 German Shepherd Dog Breeders - Advertise your kennel puppies and dogs here. GerdesHaus German Shepherds - Texas - Breeder & Trainer of working line German Shepherds for K9, narcotics, protection, and pets. All Puppies come with a health & hip guarantee, AKC Registered, Microchipped and Tattooed. Shipping available worldwide. We can also import GSD's directly from Germany. Salhaus Old Fashioned German Shepherds - California - Over 20 years of dedication in producing the oversized, old fashioned, straight backed, family Shepherd. 2 year written health guarantee & lifetime support for the pup of your choice. Allure German Shepherd Dogs - Florida - Allure is the home of AKC registered German Shepherd Dogs. We have only 1 to 3 litters a year. We breed for quality and not quantity. Our puppies are bred for conformation, sound temperament and health in mind out of only Champion bloodlines. We socialize our puppies from birth. Show potential pups and pet quality are available. We offer a 2-year guarantee and puppy contracts with each puppy, also a pedigree. Parents OFA certified. Rescue dogs available. Almanya German Shepherd Dogs - Florida - Exhibiting, breeding and raising top quality American Line GSD. Many years experience and a member and treasurer of GSDC. Stud service and puppies available. Grum Majestat Shepherds - Florida - Breeding quality german bloodline shepherds. Eichenluft Working German Shepherd Dogs - Pennsylvania - Breeding imported working-line German Shepherd dogs for work and active companion. Breeding only working-titled, hip rated, conformation-approved dogs. Puppies dual-registered, pink papered from Germany, guaranteed. Pioneer's Plush and Long Coat German Shepherds - Pennsylvania - Located in the orchards of South Central Pennsylvania, we offer large boned, sweet-tempered, plush and long coat (long haired) puppies out of oversized lines. Our dogs are not Shiloh Shepherds nor King Shepherds, but are above average size with an old fashioned, straight-backed appearance and a laidback personality. Puppies are whelped indoors and raised underfoot with young children, other dogs and cats, occasionally available to select companion homes. Vom Landholz German Shepherd Dogs - Florida - We have only the best German working lines bred for health, stability, temperament, and working ability. Suitable for sport, personal protection, or family companions. All our dogs are either 'a' stamped or OFA'd. We're located in Brooksville, FL, north of Tampa. 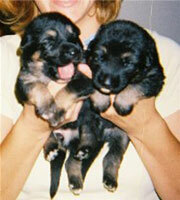 Whispawillow German Shepherd Dogs - Saskatchewan, Canada - German Shepherd Dog Breeder in Canada. 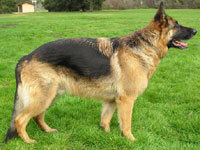 Producing top quality champion German Shepherds for show, pet, tracking and obedience. German shepherd Puppies and adults for sale. Proven pedigrees and health guarantees. Black and tan, long coat, sable, solid black German Shepherds.